Just five weeks after Best in the World, Ring of Honor was back with another offering, this time available on iPPV, this time for the thirteenth incarnation of Death Before Dishonor from the William J Myers Pavillion in Baltimore, Maryland, USA. With Jay Lethal defending the ROH World Champion against Roderick Strong in the main event and The Briscoes, The Addiction, reDRagon, Adam Cole, ACH and more all on hand for the show, how did things turn for the companies fourth PPV event of the year? Let's find out. An opening package for the show, mainly focused entirely on the main event between Jay Lethal and Roderick Strong, neglecting that there was six other matches on the card. Luckily, commentary team Kevin Kelly and Steve Corino were on hard to run down the card, with a look at the two title matches, the No Disqualification bout and Cedric Alexander vs. Moose. This worked as a nice opening bout for the show and whilst no one will be claiming that it was a Match of the Year candidate there was plenty to enjoy. Silas Young especially looked good here, with his Last Real Man gimmick working a charm against the pace of Will Ferrara. While the match was pretty basic in it's storytelling, what was done was done well, with a ambitious closing sequence that saw the momentum change numerous times before Young was able to hit Misery (Airplane Spin into a Cutter) to pick up the victory. With Dalton Castle's Boys turning up after the match, that wouldn't be the last we'd see of The Last Real Man. A decent promo package for Moose vs. Cedric Alexander worked as a sound catch-up for anyone not fully up to date with ROH storylines. This was the only match on the show that I just couldn't get into and I'm not sure why. The Baltimore crowd seemed unsure about Moose, with smattering of "Moose" chants, but no real support, whilst Alexander's fledgling heel run doesn't seem to have gathered much steam yet either. So the crowd was neither fully behind Moose or against Alexander, and ended up for the most part being rather quiet, with them perhaps on the whole being more into the stuff that Alexander was doing. This wasn't helped by Alexander pulling out a beautiful Tope Conhilo towards the closing stages of the match. Whilst the two never seemed to click in the ring, there were a couple of nice near falls, inclduing a Michonoku Driver from Alexander. The conclusion of the match also worked well, bringing together a number of different storyline elements, with Prince Nana (who was doing guest commentary) ended up getting a right hand from Alexander, as did Stokely Hathaway, but after Moose managed to gain a modicum of revenge with a powerbomb onto the apron, Alexander was able to pick up the victory after blocking Moose's spear attempt with his trusty wrench. Whilst the majority of the contest didn't tickle my pickle, I have to say the closing stages were well structured and left room for development for both characters heading into Field of Honor in August. What this match lacked in consequence, it made up for in action. Whilst this was essentially a thrown together tag team match (which was a little bit disapointing for a Jay Briscoe just five weeks removed from being World Champion) the content of the bout was entertaining throughout, picking up the pace of the show with blistering, balls to the wall tag team outing. Roppongi Vice cleverly took the role of heels for the match, as they were always going to struggle to pick up crowd support opposite the perennial favourites, The Briscoes, with the pair throwing in a number of sneaky tactics in order to take control of the bout. This gave the match a nice dynamic, and built the groundwork for the later stages of the contest. The skirmish built towards it's conclusion well with a series of near falls for both teams, including a Superkick into a Destroyer combo from the Briscoes to escape Roppongi Vice's Strong Zero. Whilst the final end sequence went a little bit too long for me, due to the match having no real build, it was thrilling to watch the two teams got back and forth with a number of big moves before Jay was eventually able to hit a Jay Driller on Berreta, followed with a Froggy Bow from Mark to give the Briscoes the victory. 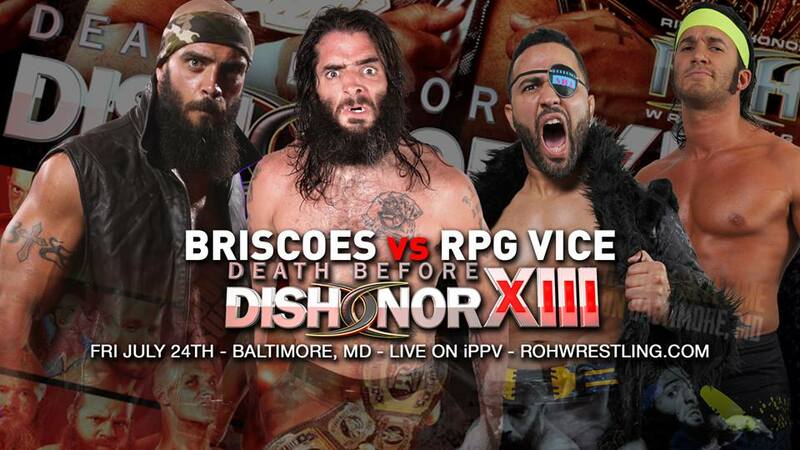 Following the result of the Four Way tag bout later in the night, one would assume that The Briscoes would be next in line for a shot at the titles, with ROH seemingly keeping the duo in the tag division for the time being. I absolutely adored this match. Dalton Castle's character has been a breath of fresh air since debuting on ROH television and he stepped up his game here opposite one of ROH's premier competitors to create a thoroughly entertaining match. Both men put in terrific character based performances, with the crowd being the hottest it had been so far, with dueling chants for almost the entirety of the bout. For someone who has only been wrestling regularly for ROH since March to be getting this kind of reaction against one of the current corner stones of the promotion, says a lot about the strength of Castle's character and how quickly the ROH fans have taken to it. It would have been easy for this contest to descend into a straight up comedy bout, with Cole more than capable of working that kind of style, as evidence by some superb facial expressions throughout, the wrestling content here was also of a high quality. The pair seemed to connect quickly in the ring, creating some nice sequences, like Castle managing to turn Cole's Panama Sunrise attempt into a Northern Light's Suplex. If I didn't like the Peacock already his selling following a lengthy spell in Cole's Figure Four Leglock had me absolutely sold, as it could have been something that had been easily forgotten but instead added an extra layer to the match. Obviously Cole was eventually able to pick the victory with a Brainbuster onto the knee, but Castle certainly had his star raised thanks to his performance here. The only real criticism I'd have here it that like the previous match, there really was no reason for these two be fighting on PPV, meaning the match lacked a sense of purpose and consequence. A promo for the upcoming ACH and Adam Page bout, was mainly focused on a promo from Adam Page, that didn't quite hit the spot for me. Before the match could get under way BJ Whitmer limped to the ring revealing that he had undergone knee surgery, whilst Steve Corino on commentary wished that he had been hit by a car, which was nice. 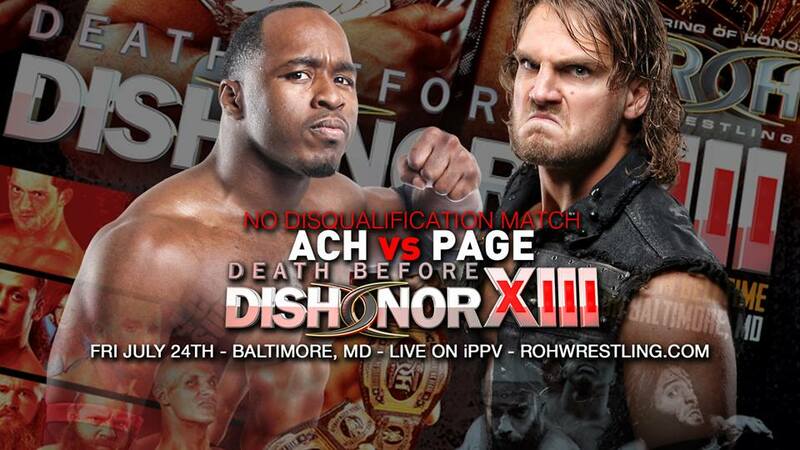 If the two previous matches had been lacking on purpose then this match had it in spades, as the feud between ACH and Adam Page that has been raging across ROH TV for months continued. From the very start of this match, even without the prior video package, it was clear that these two had a dislike for each other, thanks to the way ACH went straight after Page and how things quickly escalated throughout the match. With both guys being over in their respective roles, the crowd added an extra dimension to their grudge bout, lifting the near falls and seemingly pushing the men in their violent activities towards each other. The No Disqualification gimmick was used strongly with all sorts of weapons getting involved chairs, a ladder, tables and even a workout club (I have no idea what a workout club is, or what in fact it was doing underneath the ring). The ladder especially saw a lot of action, with Page taking a pumphandle thing onto it, before replying with a German Suplex that saw ACH taking a truly horrible looking bump after attempting to flip over during the move and landing on his shoulder. It would seem that this feud isn't over yet either, after Colby Corino caused the distraction that allowed Page to get the win with his Right of Passage reverse piledriver off the apron through a table on the outside. The finish got a great reaction out of the crowd, but unfortunately the chosen camera angle showed just how far ACH's head was away from the table, which is the fault of the production team who should have known what was about to happen. With ACH still to pick up a win over Adam Page, I'd like to think that this feud is still not over yet. This match was everything that you'd have expected it to be. Eight men going nuts, with plenty of big moves and spots and a break-neck pace. There really wasn't time to get bored with this one, as the match made full use of having so many bodies in and around the ring. A section that stands out here saw three or four dives to the outside, of different variations, as the mass of humanity built up on the outside of the ring. The pay-off saw War Machines' Hanson climb to the top rope and hit a senton onto pretty much everyone on the outside, as the big man continues to stand out with his mixture of power and agility. Whilst the bout was mainly focused on spots and ridiculous moves, there was some nice story also involved in the bout, mainly focused around the clear crowd favourites, Kyle O'Reilly and Bobby Fish, reDRagon. We saw a good length sequence with O'Reilly into the ring as he looked for a tag, whilst both The Kingdom and The Addiction both cut off O'Reilly's attempts to get a tag to his partner. Eventually this lead to O'Reilly having to tag in War Machine, took advantage of the gimmick for a nice twist on the traditional hot tag and was also the catalyst for the competitors taking things to the next level. War Machine came off a particular impressive in this one, with a number of stunning double teams move that defy their size and look. Both men worked hard to keep up with their opponents in the ring and matched them move for move, their finisher Fall Out working as a nice near fall in a match full of near falls. The Addiction stealing the win from under reDRagon's nose after O'Reilly and Fish seemed to have the match won after hitting Chasing the Dragon, only for Fish to walk straight into Celebrity Rehab (Release belly-to-back suplex into Double Knee Facebreaker) and allow The Addiction to hang onto the tag team titles, was a fitting conclusion to an thrilling bout that showcased the strength and variety of ROH's tag division. It was almost time for the main event, with a superb promo package featuring promos from both champion and challenger acting as the lead in. The first thing anyone would have noticed when scanning the results of the show would surely have been that this match went the full sixty minutes and ended up in a draw. This isn't something the modern wrestling fan is used to, especially one with WWE-centric viewing schedule. In fact, even in ROH, there hasn't been a 60-minute broadway since Austin Aries and Tyler Black went to the limit back at Final Battle 2009. Which probably why the reactions to it have lurched from "one of the best ROH World title matches ever" to "one of the most boring matches I have ever seen" across social media. People just aren't used to watch a sixty minute match anymore, so the reaction is either that of utter amazement or utter indifference. It was a rather interesting decision by ROH to go with the sixty minute Broadway here, why after so many years was this match the one that was chosen to be the one to go the distance. It would seem that ROH had either booked themselves into a corner, with Lethal only just winning the title after a lengthy build-up and Strong's renaissance storyline also still with plenty of steam, neither man could really come out of this match on the losing side. I'll give ROH the benefit of the doubt and say that they knew exactly what they were doing and that this is leading to something bigger and better, with Strong slipping back down the pack, giving Lethal more heat as the heel champion, and allowing Strong more time to continue his storyline before eventually winning back the title. After all that, shall we talk about the actual content of the match? Yeah, lets do that. I'm not sure whether I was the only one (maybe because I had a timer going on the bout) but from about ten minutes into the match it was clear that if this match wasn't going the distance then it was going to be close. The pace was curious to say the least, not quite what I'd call slow, but it was clear that the two were taking their time in the early stages, with plenty of stalling from Lethal, and a lot of technical wrestling as the two tried to out do one another, with Strong often coming out on top of the exchanges. Outside of the early technical section of the match, the pair spent a lot of time on the outside of the ring. The pair would end up out of the ring for what felt like the majority of the match, because it happened so often. This would be my main criticism of the match, as whilst the clash called for some brawling, this did feel like overkill, with a number of times that the pair would go to the outside offering nothing new to proceedings. The commentary team did spend a long time trying to get over just how hot it was in the building, as a reason for why the pair were on the outside so often, with the idea being they were attempting to escape the The two were absolutely dripping in sweat from fairly early on, but the commentary team didn't have to mention the heat for any other match on the card. Woven into the fabric of the match was the interference from Lethal's cohorts in the House of Truth, with both Donovan Dijak and J. Diesel taking turns to lay the punches into Strong when the referees back was turned. This gave the match somewhere to go whilst trying to kill time in the sixty minutes, without knackering out both Lethal and Strong. Dijak and Diesel work well in their roles as Lethal's enforcers, with the idea that everyone knows Lethal doesn't need them to win a match adding to the gimmick's strength. The pay-off for Dijak and Diesel's interference came when Strong was finally able to take the pair out with a beautiful corkscrew plancha. Truth Martini would also get himself involved in the match, causing a distraction to allow Lethal to use the Book of Truth for a superb near fall. Whilst the reaction online was mixed, the Baltimore crowd seemed to absolutely eat up everything that Lethal and Strong put together. When Strong seemed to fire up, asking Lethal to hit him with more chops, the audience went nuts. It was at this point (as the commentary team seemed intent on getting over) that the fans seemed to begin to believe that Strong could potentially win the title. Perhaps this wouldn't have been possible in a 15 or 20 minute match, but the reactions that the pair were able to get following this moment were some of loudest I've heard in ROH for a long time. The last ten minutes or so of the bout were truly fantastic stuff, with both men somehow being able to find something else in the tank despite wrestling for 50 minutes already. With Strong hitting the majority of his offence on Lethal's back, the Strong Hold got the reaction of a legitimate finish, although perhaps if Lethal had sold the back it would have been an even better moment. The highlight of the match for me saw Strong hit a Superplex, Double Knee Gutbuster and then a Sick Kick for an amazing false finish that had the Baltimore crowd convinced Strong had captured the title. Lethal redeemed his earlier no-selling, by appearing to almost throw up after failing to get the win with a Lethal Injection, which sold the moment fantastically. With the clock running out with Strong seemingly taking control after a brilliant strike sequence, and the crowd completely into the match, it left the PPV without a real finish with the show simply going of the air. Just like the opening package suggested this PPV was all about the main event. I can see why the bout wouldn't appeal to everyone, but I certainly enjoyed it. Do I think it was worthy of Kevin Kelly's claims (and bloody annoying shouting)...maybe not...but I still thought it was a great contest, that both Strong and Lethal should be commended for putting on. In a wrestling world where the main company is often afraid to take risks, it was good to see Ring of Honor attempting something different. The rest of the show (with the exception of Alexander vs. Moose which did nothing for me) ranged for decent to very good, with the Fourway tag team bout and the No Disqualification matches working as strong contrasts to the main event, both showing something different and showcasing the variety that ROH can offer. Other bouts suffered from having no real reason to be going ahead, and whilst they were entertaining, it would have been nice to have seen a little build on TV or a live events.